Electrolux workers in Memphis who achieved a breakthrough first contract. Greetings from Washington, D.C., where Payday Senior Labor Reporter Mike Elk has arrived to help his union in this week’s picket line of the Washington Post. Amazon owner Jeff Bezos, who also owns the Washington Post, is currently demanding that the union weaken security language as part of negotiations. The Post has already threatened to fire Washington Post Union Co-Chair Fredrick Kunkle for writing a HuffPost op-ed critical of Bezos. Many fear that the move to weaken security language in the contract could be a sign of things to come. Check out our story on how young people are driving gains in membership at the open-shop Post as Bezos takes an anti-union stance. In a sign of the weak labor beat, Payday was the only outlet to cover the first ever picket line at the Washington Post building. We spent $60 in gas and $70 on a motel in Hagerstown to get in, help out with the gas if you can donate here. Payday is currently only one monthly new donor away from hitting our September goal. Sign up to become a monthly member or make a one time contribution here. 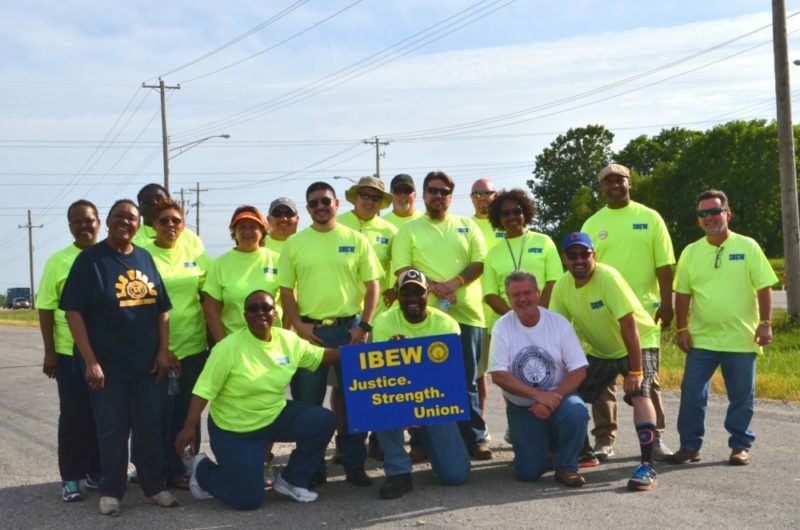 In September 2016, Payday covered an impressive win by the IBEW on its second attempt to organize Electrolux’s 700-person plant in Memphis. 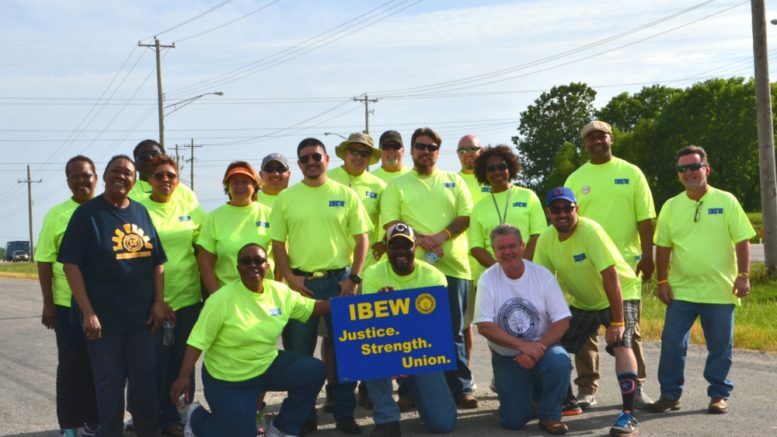 In May 2015, the IBEW lost its first attempt by a margin of 57 votes. Instead of giving up, the workers kept pushing hard for another vote and winning over hesitant voters by persuading them that the company’s promise to reform was hollow. In a dramatic reversal of fortune, a little more than a year later, workers at the plant voted to unionize 461-193. Now, less than a year later, the workers already have a first contract, ratified by a vote of 231-30. The contract contains a 3% wage increase in each year of the contract. Starting wages at the home cooking appliance plant are only $12.59 an hour, while the average worker makes slightly less than $16 an hour, according to the Memphis Commercial Appeal. The contract also includes increases in paid time off and improvement in the disciplinary policy over absenteeism, which many at the plant felt was administered unfairly. For a union to achieve a first contract in a little under a year is a significant achievement. Carl McPeak, the IBEW’s lead organizer for Western Tennessee and Arkansas credits the role of the Swedish union IF Metall, a 325,000-member strong manufacturing union. Prior to the second IBEW vote, members of IF Metall put pressure on Electrolux’s corporate headquarters in Sweden to avoid using some of the most aggressive anti-union tactics. While the company still employed captive audience meetings, organizers say that their tactics were less ugly than the first time and proved ineffective. IF Metall even filmed a video voicing their support for Tennessee workers and pledging to have their back as they sought a union. “That swayed a lot of votes seeing that people all the way from Sweden where in their corner,” the IBEW’s McPeak told Payday. Now, with a first contract in Memphis, the IBEW now plans to go after the 1,500-person Electrolux plant in Springfield, Tenn., outside of Nashville. In an NLRB report filed earlier this month, the UAW is reporting that for years Nissan illegally tracked the union preferences of its employees. In the complaint, which Bloomberg News obtained through a Freedom of Information Act request, the UAW asks the NLRB to subpoena the automaker and investigate its claims. This month, the North Carolina AFL-CIO took a major step when it elected MaryBe McMillan as President of the North Carolina AFL-CIO. McMillan first got involved in the labor movement as a graduate student at North Carolina State, where she helped to organize campus workers with UE Local 150, the North Carolina Public Service Workers Union. As Secretary-Treasurer of the North Carolina AFL-CIO, she got the labor movement heavily involved in fighting HB2, the anti-transgender bathroom bill, and had sought to build channels of communication between poor rural whites and African Americans throughout the state. “I look forward to working with our affiliates to build the movement we all want—one that is constantly growing, that is both big enough and bold enough to set the agenda and drive our politics, that is unafraid to hold our politicians and our own leaders accountable—a movement with the power to change this state and this nation,” McMillan said in a statement announcing her new position. Check out Indy Week’s Labor Day interview with McMillan. Andrew Gillum, the 38-year-old African-American mayor of Tallahassee, has quickly emerged as the frontrunner in the race to be the Democratic nominee for Governor in 2018. His positions and track record have earned him the endorsement of Democracy for America. This week, Gillum signaled his support for raising Florida’s minimum wage to $15 an hour. Gillum has raised more than $1.34 million and is expected to be one of the leading candidates in the gubernatorial race. Currently, D.C. only has one Confederate statue, as the city was considered Lincoln’s Citadel during the Civil War. The statue is a tribute to Albert Pike, a freemason and Confederate general, which sits on federal park land. Since the monument was installed by an act of Congress, D.C. Delegate Eleanor Holmes Norton (remember they have no congressional vote) introduced a bill to remove it. This week, Norton visited the freemason’s southern jurisdiction, which originally gifted the statue to D.C., and garnered its support for her bill. Many have debated over the years whether D.C. is a Southern city. Located just across the river from Robert E. Lee Highway and the right-to-work suburbs and cities of Northern Virginia, the city has long been considered a melting pot of the North and the South as young college graduates from Virginia and North Carolina populate many of the white-collar jobs in the city. During Jim Crow, the nation’s capital was segregated despite having visitors from all around the world. Today, the economic and racial segregation of D.C. continues to fuel inequality. The study finds that people of color aren’t benefitting from D.C.’s boom times to the same extent as their white peers, who saw a 12 percent increase in median household income from 2007 to 2016. Based on official numbers from the U.S. Census Bureau’s 2016 American Community Survey released yesterday, the D.C. Fiscal Policy Institute contends that by various measures, the District’s black and Hispanic populations are falling behind. As of last year, the median annual income for black families, $37,891, was just 30 percent of the median annual income for white families, $127,369. The black median income was also down more than $4,000 as compared to 2015 (when it was $42,062), “a rare statistically significant year-over-year change,” the nonprofit DCFPI explains in a release. Furthermore, from 2007 to 2016, the black poverty rate rose more than 5 percentage points, from 22.7 percent to 27.9 percent, while the white poverty rate hovered just above 7 percent. Last year, the poverty rate for D.C.’s total population of around 650,000 was 18.6 percent, meaning the black poverty rate was almost 10 percentage points higher than that. Among Hispanics, the poverty rate ballooned from 11.6 percent to 17.8 percent between 2015 and 2016, DCFPI says. But for whites, it only grew 0.3 percentage points over the same period, which isn’t a statistically significant change. For years, local money had fueled downtown’s growth, but outside capital was finally flooding in. In fact, 2016 would prove to be a tipping point. For the first time, half of the projects in the city’s urban core were being funded by out-of-towners. On the other hand, much was brewing beneath the surface. Minority and working-class families with roots in the city were suffering, an abundance of research proved. Housing costs were rising, contributing to a severe shortage of affordable housing. Public schools were failing to prepare a majority of children to make a living wage. Poverty was growing among all races, and few born into poverty were finding a path out. Violent crime was escalating alongside this sense of economic desperation. With Amazon’s decision to seek bids from cities for a second headquarters, the company and its CEO billionaire Jeff Bezos’ impacts on the American political economy are under deeper criticism than ever. If Bezos were to engage in a prolonged fight with the union at the Washington Post—and public opinion turned against him—it could hurt the company’s brand at a time that it is seeking tax breaks from cities across the country. More than this, high-profile newspaper union fights at publications are fought in the court of public opinion. If the public turns against a newspaper union, it’s often been indicative of deeper trends in society. The pressmen’s strike was a watershed moment, and this was understood at the time, even if it has since been erased from history. “Other publishers and corporations across the country are watching to see if a ‘liberal’ employer can actually get away with destroying a union in the media spotlight of the nation’s capital,” a Local 6 pamphlet noted at the time. Among those watching the strike play out was a governor in California. Six years later, as president, Ronald Reagan would go after the air-traffic controllers’ union. When Reagan did so, it may have been with the understanding that, as with the pressmen, the big papers were unlikely to condemn his union busting. Could a defeat of anti-union forces at the Washington Post be a seen of the tide turning in favor of unions nationwide? Stay tuned for more here at Payday. Donate to Payday to help us cover the cost of gas of covering this week’s picket line at the Washington Post. Be the first to comment on "Memphis Electrolux Workers Win 1st Contract – WaPo Threatens To Fire Union Chair – N.C. AFL-CIO Elects Woman as New President"